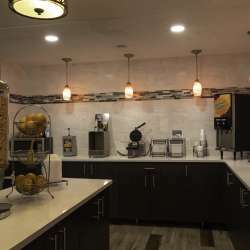 In a community celebrated for its “sweet water” lakes, there’s something unique and appealing about the saltwater experience at Baymont by Wyndham (formerly Baymont Inn & Suites). “Our indoor, saltwater pool is a huge draw,” explains General Manager, Laura LaParr. “Guests love the slightly cooler water and the fact that it’s gentler on your skin and hair.” Both the pool and hot tub use saltwater, with bromine added to the hot tub, due to the heat. The pool and patio aren’t the only thing guests will notice at Baymont. The property, which underwent a management change a year ago, is completing a comprehensive renovation. It now offers adjoining room scenarios—ideal for families—so parents can enjoy some privacy, while also being close to the kids. 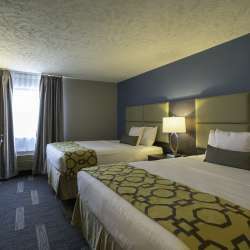 Additionally, all the rooms have a fresh, new look with a contemporary color scheme. They also have new furniture, done in stylish Espresso wood. The rooms also have stand alone closets, another smart upgrade that adds convenience.